Can a ring be both glamorous and understated? 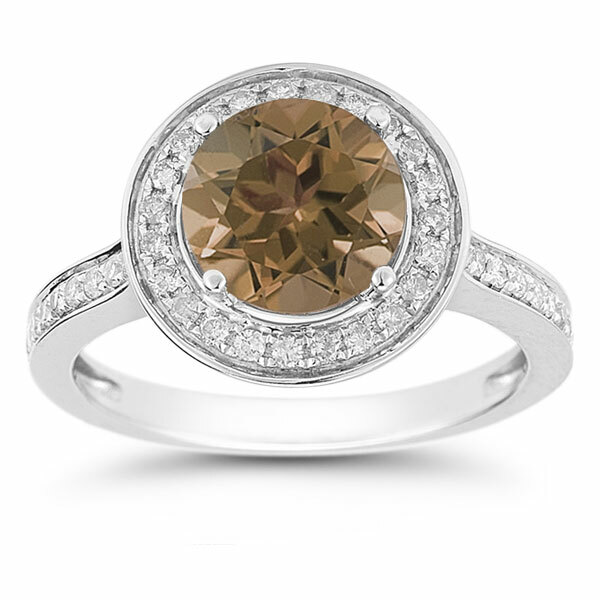 This Smoky Quartz and Diamond Halo Ring in 14K White Gold answers that question with a big yes! By accenting a warm, softly glimmering gemstone with 43 accent diamonds, this simply stunning style is unique and classy, with an allure that's hard to deny. A unique gemstone with a subtle hue is the focal point of this classy ring. This 8mm round smoky quartz has, as its name suggests, a brownish hue that calls to mind a curl of smoke rising from a burning ember. This semiprecious gemstone seems to capture the essence of autumn with its versatile sparkle, and portray it in a design with trend-defying glamour. This unique gem is accompanied by 0.43 carats of diamonds that contrast the rich yet soft glimmer of this smokey quartz and reflect it with class. Some of these small round stones comprise a frame of colorless sparkle around this center gem, while the rest accent the shining 14K white gold band. This halo ring, with its Art Deco-inspired style, gently yet surely catches the eye. While this piece isn't complicated, and its starring gemstone is less than bolds, its striking sense of sophistication is undeniable. 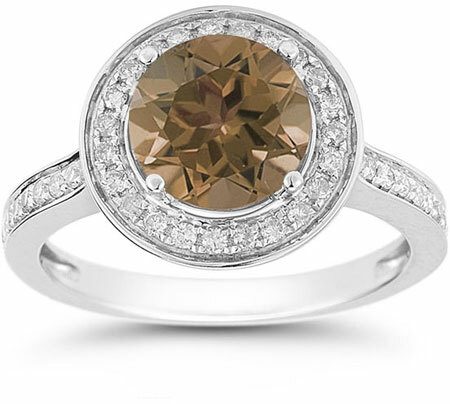 We guarantee our Smoky Quartz and Diamond Halo Ring in 14K White Gold to be high quality, authentic jewelry, as described above.